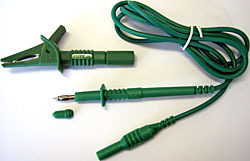 We make a large number of customised customized leads and assemblies in our UK and China factories. 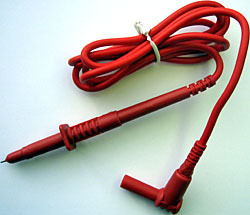 These can combine standard power plugs with test leads, custom made instrument plugs, and other customised customized connectors. We can insert moulded molded cables into special configurations. We can proof test up to 20KV, testing 100% when needed. Since many test leads are safety critical parts, we aim for zero defects in all our test leads. We comply with the relevant specifications and all parts are CE and RoHS compliant. See the PDF data sheet: Test Leads and Accessories (opens in a new window).